The Fantasy Trip Legacy Edition is set to leave the factory in the next few weeks, which means that it's time we turn our attention to the game's future. Over the last few months, we released two different PDF adventures for the game on Warehouse 23. Your feedback on them made one thing very clear: You want these in print! Say hello to The Fantasy Trip Adventures, now funding on Kickstarter! 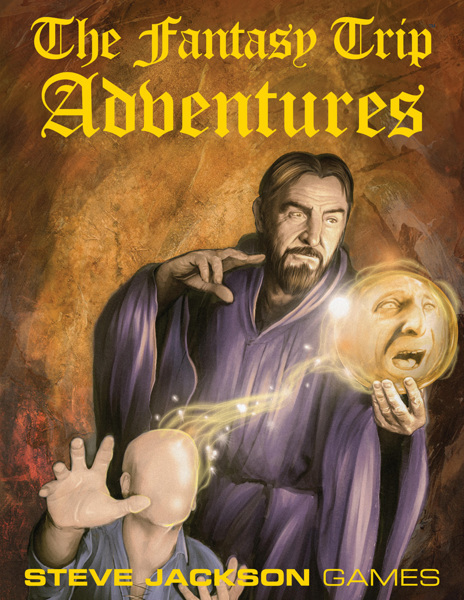 This new project collects the two recent PDF adventures along with three new adventures into a printed softcover book . . . complete with die-cut counters and megahexes! The project is our way of showing you that (1) We're listening and (2) We're planning to give The Fantasy Trip a lot of support in 2019. Many of you came together last summer to push the Legacy Edition to unexpected heights, and we're going to do what we can this year to give the game the attention and respect that it deserves. This new campaign also marks the launch of our second Kickstarter account: Warehouse 23. Why a second account? In 2018, as we brought multiple projects to Kickstarter, we had to keep answering one common question: Will this be in stores? After discussion with the Kickstarter crew, we decided to open a second account for those games (and accessories, and whatever niftyness we decide to tackle) that are not planned for release to distribution. Projects created under this new Warehouse 23 Kickstarter account are not exclusive to Kickstarter, but they are likely to be found only in Warehouse 23 after the rewards are delivered to the project backers. Please visit the Kickstarter page today. If you missed out on last summer's campaign, this is your chance to get in on the hefty "I Want It All" package and some of the other items that were created as a part of last summer's campaign.